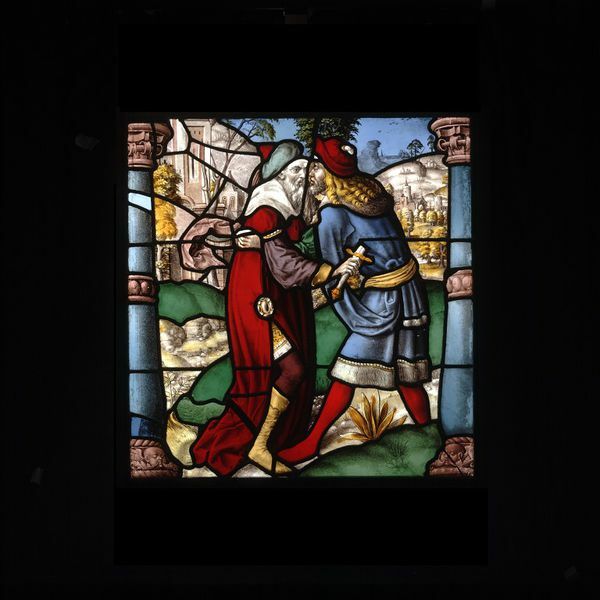 This panel depicts the Old Testament story, from the Book of Kings, of Joab stabbing Amasa. Joab was a nephew of King David and was appointed by the king to be one of his military generals. Joab desired more power and was envious of the favour David bestowed upon his other generals. So Joab killed two of the king’s other military leaders, Abner of Israel and Amasa of Judah. This panel is one of many in the V&A’s collections that come from the cloisters of the Abbey of Mariawald in Germany. Mariawald was a Cistercian abbey founded in 1480. The Cistercians were a monastic order established in 1098 in Burgundy at Citeaux. The founder of the Cistercians had broken away from the Benedictines which had been the first monastic order to be established in Europe, in the 6th century. During the Revolutionary struggles in France and the subsequent religious upheavals under Napolean, many monastic institutions on the continent were ‘secularised’ and their buildings destroyed. The abbey of Mariawald was closed down in 1802 but fortunately its buildings, including the cloisters, remain intact. However, the stained glass windows had been removed and it is believed that they were purchased by John Christopher Hampp of Norwich. Hampp sold the Mariawald panels to various churches and to private collectors. Many of these were purchased by the collector, Lord Brownlow who had them installed in his new chapel at Ashridge Park in Hertfordshire between 1811 and 1831. In 1928 the contents of Ashridge Park were sold at auction and a private collector purchased the stained glass and gave it to the Victoria & Albert Museum. The Mariawald stained glass panels come from ten windows on the west and north sides of the cloister, plus one from the north end of the eastern part. The glazing of these cloisters began about 1510 and seem to have been completed in the 1530s. As the cloisters were never dismantled we can reconstruct how the panels were placed in the architectural structure. The window openings in the cloisters were each composed of two openings (‘lights’). Each light was composed of three panels. So there would have been six panels to each window. From the surviving stained glass panels we can determine the theme of the cloister glazing. Each window had two panels depicting scenes from the Old Testament and two panels with scenes from the New Testament. Above the biblical story panels, were two smaller prophet (or ‘messenger’) panels. These contained half-images of Old Testament prophets holding scrolls with text relating to biblical passages connected with the scenes below. At the base of each window were donor and patron saint panels. These donors were the ones who contributed to the financing of the cloister glazing. This type of narrative arrangement is known as ‘typological’. Each Old Testament story was a ‘type’ or a prefigurement of a New Testament story (‘antitype’). For example, the Old Testament story of the ‘Stabbing of Amasa by Joab’ was a prefigurement of the New Testament ‘Betrayal of Jesus Christ by Judas’. The typological arrangement was popular in the Middle Ages. The stories were reproduced in manuscripts and in engravings from woodcuts and collectively were known as ‘Biblia Pauperum’ (‘Bibles of the Poor’). At the end of the 15th century the Biblia Pauperum were printed in book form and sold in their thousands. These books were used as design sources for artworks including stained glass panels. Joab wears a red cloak with white collar, purple coat, red hat. Amasa has a blue coat and a red hat. Landscape background with buildings in grisaille and yellow stain. The columns at the side are blue and purple. In the cloister of Mariawald until about 1802. From about 1811 until 1928 it was installed in the Chapel at Ashridge Park, Hertfordshire. (12 July 1928) Sold at Sotheby's. The glazing of the Mariawald cloister, confined to ten windows on the west and north sides and one at the north end of the east walk, and made up entirely of two-light windows, seems to have started at the beginning of the second decade of the 16th century and probably continued until the early 1530s. From the surviving panels and the existing windows it can be seen that the programme was made up of paired Old and New Testament scenes arranged typologically one above the other (New Testament at the second level, Old Testament in the third), as in the Biblia Pauperum, with donor panels placed on the lowest level. A prophet with a scroll occupied the cusped head of each light. Mariawald was a Cistercian abbey founded in 1480. The Cistercians were a monastic order established in 1098 in Burgundy at Citeaux. The founder of the Cistercians had broken away from the Benedictines which had been the first monastic order to be established in Europe, in the 6th century. This panel is one of many in the V&A that comes from the cloisters at Mariawald. These panels come from ten windows on the west and north sides of the cloister, plus one from the north end of the eastern part. The glazing of these cloisters began about 1510 and seem to have been completed in the 1530s. This type of narrative arrangement is known as ‘typological’. Each Old Testament story was a ‘type’ or a prefigurement of a New Testament story (‘antitype’). For example, the Old Testament story of the Sacrifice of Isaac by Abraham was a prefigurement of the New Testament ‘Sacrifice of Jesus Christ on the Cross’. Clear and coloured glass with silver (yellow) stain and painted details. Depicting Joab stabbing Amasa. Possibly made in the workshop of Everhard Rensig. Germany (Lower Rhine), about 1516-22. From the cloister of the abbey at Mariawald.